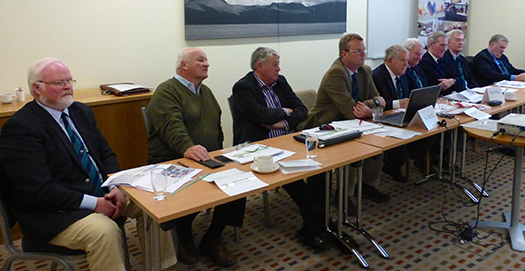 #isaagm – W M Nixon gives us some impressions of today's Annual General Meeting of the Irish Sailing Association. There have been two years of accelerating soul-searching and increasingly incisive analysis of the problems of the Irish Sailing Association. That process has been followed by this year's thorough two month tour of the country, taking the proposed Strategic Development Plan on the road for further refinement. And that was done by consulting the many sailors who are concerned about the future of their beloved sport. After all this, there was no way that today's Annual General Meeting to consider approval of the Plan, along with the usual business of an AGM, was going to be anything other than businesslike. And if you can find a more businesslike setting than a windowless meeting room of a certain size in a motorway hotel in the anonymous middle of the country, then this particular sailor doesn't want to know about it. Yet I'd be delighted to meet again with any of those sailing stalwarts who made it their business to be at this meeting, which both fulfilled the legal requirements of being a truly national authority, and at the same time tried to plan the way ahead. For these people care deeply about their sport, and they have nothing but underlying goodwill for those who are trying to make the ISA more accurately reflect it, and its future needs. A Saturday evening is no time to be considering the grinding detail of the new plan, for heaven knows they've been raked over in enough detail on the Afloat.ie website in recent months. And in any case, they'll be released officially in due course next week. But for now, a few impressions won't go amiss. There may not have been a large turnout, but it was perfectly respectable in size, even if there was only one woman sailor, but as she was Cathy McAleavey she was worth a dozen men. And there too were the main men from clubs as diverse as Royal Cork and Blessington and Howth and many others. And key to the whole thing, quietly sitting side-by-side, were Bryan Armstrong of Sligo and Norman Lee of Greystones. They are the two "ordinary club sailors" who, two years ago, set in motion, despite all sorts of rebuffs, the glacial process of reform which will in the long run do Irish sailing no end of good. For what these two guys – who aren't in the slightest bit ordinary at all – managed to do was to get the powers-that-be to stop and listen, and listen carefully. And in the end, the powers-that-be found this to be an extraordinarily invigorating process, and good for the soul of Irish sailing. Thus the ISA called on many talents from all round the country, and Presidents from times past such as Neil Murphy and Roger Bannon, to undertake a ferocious self-examination. It was done so thoroughly that in some areas they may have gone too far in planning to throw out what they mistakenly thought to be deadwood. But thanks to the consultation process, some very useful retaining modifications were made which should result in a national sailing and boating authority which truly represents those who go afloat for recreation on sea, lake and river. So after reasonable consideration, adoption of the plan was successfully proposed by former ISA President John Crebbin of Dun Laoghaire, who is an Irish representative on the International Sailing Federation, and seconded by Alex Blackwell of Mayo SC, who had been one of the most eloquent critics of the plan in its original form. Being an AGM, points of interest emerged. It was fascinating to have it clarified that the ISA's income is 37% reliant on Sports Council grants. And in this time of cutbacks, it was reassuring to hear from Board Member Colm Barrington that the High Performance Sailing Fund - which is his particular baby within the ISA remit - will be relying on philanthropic private donors, many of them anonymous, and will in no way impinge on established or developing commercial sponsorship for the main body of the sport. It was also intriguing to hear Neil Murphy, finally at the end of his Herculean task of shaping the Strategic Development Plan 2015-2020, express the hope that with a bit of a fair wind, we might hope to see the number of active sailors in action in Irish waters increase to 25,000 by 2020. My own feeling is that the ISA's current estimate of 17,000 active sailors today verges on the pessimistic side, as it is totally reliant on figures from clubs, and we all know of clubless sailors going happily afloat. But there are others who could be persuaded, if the package is properly designed. The ISA is taking on extra talent onto the Board, which is eventually going to increase to twelve, and there was a particularly warm welcome for new appointee Paddy McGlade of Cork, who as a former Admiral of the Royal Cork and a highly regarded figure in the cruising community, is just the kind of person needed to broaden the Association's scope. However, there was a much regretted retirement from the Board, that great seaman Philip Cowman of Wexford. But his seven years are up, and rules is rules. Looking to the future, one of the points made from the floor was that in this increasingly regulated world, regular and persistent representations to government departments should be one of the ISA's central activities, and this too has been accepted. Thus one of those who will shortly be co-opted onto the Board is former President Robert Dix, who has unrivalled experience in negotiation and representation at the highest levels. At a more basic level, concern was expressed about the recurring difficulty of communicating with the sailing community generally, and the meeting – having been determinedly maintained at a properly humdrum level – came to its conclusion on a high, leaping to life with an entertaining and very professional presentation by Noel Davidson of the ISA Communications Sub-Committee on how Irish sailing can cope with today's multiple media. Time was when many of us went sailing to get away from it all, to get clear of the tyranny of the telephone. But fair play to Noel Davidson, he made it all seem fun. Good morning ladies and gentlemen and thank you for giving up your Saturday morning to attend the AGM of the ISA. This past year has been one of incredible change for your Association, but the change is not finished. Your Board has embarked on a process aimed at making the ISA more relevant to our members, weather they be clubs, individual members or training centres. But at the outset, let me say that while we are aiming high, we will not be able to deliver on everyone's expectations of what the ISA should be doing. The Directors and I are constantly getting emails from members complaining that we are not addressing some particular aspect of our activities that they feel to be of critical importance. I take it as a compliment that members are writing to us and giving out about something which they feel we should do differently. It is good to have members who engage, we cannot solve everything, but it is better than no one contacting us because we are considered to be irrelevant. As part of the process of redirecting the focus of the Association, it was necessary to make two positions redundant. This led to Tony Wright and Ed Alcock leaving the Association. This was a hard decision and only taken after a lot of consideration. At about the same time Rachel Solon was head-hunted by Wilson Hartnell and Sylvia left to teach English in Vietnam. I would like to acknowledge the terrific service that these staff members gave to the Association over the years and wish them well in the future. Also, I want to thank the staff that was left, namely Carol, Liz, Ana, Gail, Ciaran and Nuala and especially Harry for keeping the ship afloat. Thank you. While this was a massive upheaval, it did allow us to set about the objective of providing a better service to our members. To this end, we recruited a new RDO, Sarah Louise Rossiter, who will be responsible for the East region. This will allow, Gail and Ciaran to spend more time working in the South and West respectively. Sylvia has been replaced by two part-time staff Sheila and Rachel. In addition, we are in the process of recruiting a new Communications and PR Manager. For me, the most significant development has been the production of the new Strategic Plan, which is before you later in the meeting. To produce the Plan, we put together a small group comprising; Brian Craig, Ruth Ennis, Peter Reddin, Sean Craig, myself and Harry Hermon, under the incredible guidance of our most able Chairman, Neil Murphy, a past President of the Association. Indeed, it is interesting that there will be three past Presidents working in the ISA this year: Neil, as Chairman of the Strategic Planning Group, Roger Bannon, our Treasurer and Robert Dix will be co-opted to fill the remaining Board vacancy. The Plan before you today is the culmination of many hours work and consultation, aimed at ensuring that the ISA is focused on providing value for our members and growing participation in sailing. We have been making progress on the Communications side. We are finalising a new web-site and have come to an agreement with Afloat to share information. As mentioned, we will soon have a new Communications and PR Manager on-board. This will then allow us to develop a communications strategy, focused on the Strategic Plan. ISA /Afloat Sailor of the Year: Anthony O'Leary. Not many sailors get to win the Commodores Cup twice and then round off the year by winning the All Ireland Helmsman's Championship. Congratulations to all. To my great disappointment, I was snow-bound in Washington and was unable to get back for the event. The High Performance side of the house continues to produce incredible results. Like the Rugby, we constantly punch above our weight. - We already have three boats qualified for Rio: the Laser, Laser Radial and the 49er. - Gold Fleet at Worlds for 49er fx sailors Andrea Brewster and Saskia Tidey who as a result break into the senior team. Sincere congratulations to James O'Callaghan and Rory Fitzpatrick for incredible results. None of this would be possible without the continuing support of the Irish Sports Council, who continue to provide substantial funding for the HP side and of course Providence Resources. In addition, the OSG, in consultation with the Irish Sports Council, has been identifying additional sources of funding. This is leading to the establishment of the Irish Sailing Foundation, based on philanthropy, a model used by other sporting bodies and charities. This Foundation will seek philanthropic donations aimed at furthering competitive sailing, including the pathway and donors will have the option of specifying where they want their money spent. 2) There is no financial risk to the ISA. The first two years funding for the Foundation are already secured through grants from the Irish Sports Council, who are fully supportive of the initiative and a philanthropic donor. And finally, the Board of the ISA fully endorses this initiative. On the financial side, the financial reporting and budgetary systems were redesigned and enhanced financial governance procedures were implemented. The run cost profile of the organisation was significantly reduced and resources were reallocated to areas of activity which were regarded as having more relevance to members. Plans for 2015 include a major investment in developing new and more efficient IT systems which are better suited to providing the appropriate infrastructure which will support the professional staff in delivering efficient and cost effective services to all our members. The Training Policy Group is selected to achieve a representative mix of the different aspects and skills of those involved in ISA Training – clubs, commercial centres, instructor trainers, junior organisers, coaches and national trainers. Nine group meetings were held with the focus on addressing the key training issues raised in the SRG Report. · Establish a panel of Instructor Trainers that provides leadership in standards and consistency in the delivery of training to instructors. · Raise the importance of having active double handed sailing at junior and youth levels in member clubs. · A scheme by scheme comparison of the RYA and ISA schemes was undertaken and meetings held with senior members in RYA to explore opportunities for partnership. The potential to work together was seen by both parties to be in the Cruiser (Sail and Power) area and this being followed through by a working party at present. · Discussions with clubs and Junior organisers highlighted the need for the ISA to provide specific guidance to clubs on how best deliver ISA training in the club environment. It is hoped the recently launched on-line Training Guide for Clubs will result in the clubs deriving additional benefits from running our training programmes. · capture key data not currently available to centres or the ISA. This project is being developed in conjunction with a Canadian software company supplying similar software to the Canadian Sailing Association servicing 20,000 sailors. · The Instructor Trainer panel was brought together for two weekend conferences over the past six months to introduce new structures and formalise their relationship with the Association. A new mandatory Instructor Trainers Contact has been put in place and three volunteer National Trainers appointed. The TPG will be bedding down the full implementation of these contracts during 2015. · The TPG are also looking at how best to provide guidance to members and clubs on the range of boats available and how to get more double handed sailing at junior and youth level to help the retention sailors not suited to the single handed route. The attention for the coming months is to bring the current matters to a conclusion and then focus on others aspects of the Strategic Plan. 2014 saw the renewal of a Memorandum of Understanding between the ISA and the Cruiser Racing Association - ICRA. This new agreement makes for a closer cooperation between the two organisations with ICRA representation on the Competitions Policy Group and the ISA Director of Racing joining the ICRA Committee. Training, specifically for crewing on cruiser racers, had been identified as an urgent necessity. Funding has been agreed for a new training scheme initiative to be developed specifically for this purpose. The first stages of this scheme will be in operation early in the 2015 season. Previously it was not possible for Training Centres to race in other clubs' events unless the helm was a member of a Category 1 club. The prescriptions of the ISA have now been amended in order that training centres can now have official access to the Racing Rules of Sailing in order that they may run, and their boats/clients may compete in other clubs' events, without becoming a Category 1 establishment, or member. It is important we promote greater progression from training centres into clubs and this initiative is seen as a help in this objective. The rules where coaches have to be used in this scheme has been changed so that classes may now avail of a grant to help fund a non ISA coach who has specific knowledge of that class. The Classes Policy Group identified there was a great lack of understanding as to what classes were active, and in which clubs. To address this situation we are undertaking a survey of all clubs. To date approximately 40 clubs have responded. We are hopeful of more returns in the coming weeks. The process has already started of accumulating and processing this data which will give us a more accurate insight into the strengths and weakness of racing at club level in Ireland. With this fundamental information we will be far better served to help both clubs and classes in terms of promoting inter-club racing and assisting classes with information on clubs who are open to running events. It is already evident that many classes, with some notable exceptions, are struggling to maintain fleet numbers. We have already identified and are promoting the concept that classes should combine with others to make viable numbers for clubs to host events that work for the classes and clubs alike. The RS class is a perfect example where Feva, RS200 and RS400 now combine with 50/60 boats being the norm at their events. Other successful combined events in 2014 included Flying Fifteens & Fireballs and J109 & Ruffians to name a few. The strength of the single handed classes, Optimist, Topper and all Laser rigs continue to dominate dinghy racing. We are very anxious to support, especially among younger sailors, the increased participation in twin handed dinghies. The survey will give us a good insight into where we can best support and encourage this objective. Intervarsity racing continues to be very active and is extremely well organised by IUSA, however we still have an, as yet, unresolved issue with how we keep sailors involved in our sport post third level. The new initiatives from ICRA and a renewed promotion of senior twin handed classes are some steps that may help this cause. Denis Kiely has come back on board as our National handicap coordinator and we are particularly fortunate to have his expertise in this area. Work is in hand to promote all cruiser racing clubs to use software that can easily accommodate the collation of ECHO handicaps on a national basis. The Race Officials Policy Group continues to promote participation in the various Race Official seminars, Levels 1 and 2 for race officers and the Race Team course for anyone involved in running an event both on and off the water. The Umpire and Jury Officials have also been holding talks in their areas of expertise. ICRA have organised an IRC Measurement course in collaboration with the RORC which is taking place today. A total of 8 courses have been run over the last 12 months with a total participation in excess of 150 volunteers through the different disciplines. We continue to look at new ways of promoting and educating Race Officials and are pleased to announce a new collaboration with the RYA on the role out, later this year, of new Race Management courses. I would like to state clearly that the ISA is in full support of ISAF in reinstating Paralympic sailing in 2020. The ISA and Paralympic Ireland just took delivery of our new fleet of 2.4m boats showing our commitment and support to International competition and we continue to develop and extend the Sailability programme throughout our clubs. The ISA Board has had considerable engagement with cruising members during the past year. Work is ongoing in developing cruising contacts around the coast as well as inland with cruising and dinghy cruising interests. Together with the Cruising Association links are being built which will provide numbers over the next few years to support more coastal cruising. Most clubs have provided little for their cruising members and the term Rear Commodore Cruising nowadays tends to mean "Rear Commodore Cruiser Racing" with little provided for the local cruising member who joined the club in the first place because they thought they needed a club. The ISA is now encouraging clubs to appoint a committee member for cruising interests. This will ultimately encourage more day sailing, weekend cruising, and promote safety exercises, training and more family participation. Irish Cruising Association members have met on a number of occasions and will continue to represent sailors' interests. Boat Registration under new legislation is a big concern for many which requires a sensible interpretation by the Government to encourage Irish registration. Likewise, diesel availability for the cruising sailor has been raised with representations made to Revenue . The ISA also made submissions to the Maritime Safety Directive during the year. On the Access and Participation side, we are running a new initiative this year called Try Sailing, which is a grass roots initiative to encourage the Irish public to give sailing a try, through a campaign of Try Sailing sessions available in ISA clubs and centres throughout Ireland. As part of the Try Sailing launch and to gain media exposure, on the 21st June 2015 we launch the inaugural Try Sailing Challenge - calling upon Ireland to get the largest number of sailors on the water on the longest day of the year - creating a goal for subsequent years. Making Try Sailing sessions available at high profile events throughout the year. Spectators at an international event such as Volvo Dun Laoghaire Regatta or Volvo Cork Week would also have the opportunity to get out on the water for a fun session. Dedicated Open Days for Try Sailing at clubs and centres on dates of their choosing, to coincide with their own regional events. ISA Clubs and Centres scheduling regular 'Pay n Play' Try Sailing sessions, making sailing accessible as a regular sport or hobby to non boat owners. As part of the National Water Safety Awareness Week, water sports clubs and schools all over the country will open their doors for people of all ages and abilities to try snorkelling, kayaking, canoeing, surfing, windsurfing, power boating and of course Try Sailing. National Schools throughout Ireland will be sent Irish Water Safety information packs to help spread the message of safety on the water. We are encouraging all ISA clubs and centres to get on board for this great initiative by opening their doors and providing an opportunity for their local community to try sailing. Your local RDO will be calling on you! The J80 Sailfleet continues to provide and excellent return to sailing and was an excellent initiative, when introduced a few years ago. In 2014 the J80's were based predominantly in Howth Yacht Club following a request for proposals concluded through the ISA. HYC won the request for proposals and a contract was signed from April 1 2014 to March 31 2015. The use of the fleet extended across club racing, junior keelboat training and corporate events. The fleet also acted as a means of introducing newcomers to sailing. The fleet was also used for the Women's World Match racing Championship, held in Royal Cork Yacht Club in May-June 2014 and the All Ireland Championship in Howth later in the year. I am also delighted to report that there were no instances of sailors contravening the anti-doping rules in 2014, and that our sport continues to remain drug free. In conclusion, I would like to thank the ISA staff and all those who have given their time during the past year in assisting the Board in developing its policies and to thank two Board members who are stepping-down today, namely Mike O'Connor and Philip Cowman, both of whom have served for seven years on the Board.